I have been riding bikes for many years and like to think of myself as quite a fast but safe and competent road rider. Over the years I had often thought about riding off road, but from my limited experience of messing about up Aggs Hill on an old DT175 as a teenager I knew motocross was never going to be for me, as despite being able to cope with almost unlimited power and speed on the road, off road is a completely different ball game and so I looked to trail riding as the best option, as it is a bit more of a manageable pace, plus you have the added benefit of seeing many miles of beautiful countryside. The first thing to do was to get a suitable bike. Initially I looked at enduro bikes, as they are lightweight and have plenty of power, but was put off by the high maintenance required. 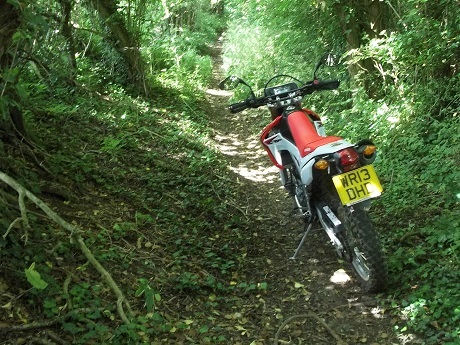 So I decided a trail bike was a better choice and went for a Honda CRF250L, as this had 8000 mile service intervals, allowing me to simply fill up with fuel and go. On long road rides this little trail bike does feel a bit gutless at first, especially compared to big road bikes, but you soon get used to it, and once you get on the trail it is plenty fast enough, and great on the narrow twisty lanes between trails, plus the added bonus of not having to worry about getting points on your licence as it is all done within the allowed speed limits. 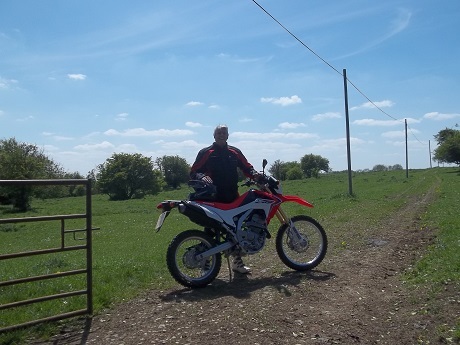 Once I got my CRF I headed straight for Aggs Hill and brought back loads of memories from my youth, but I soon got bored of riding the same bit of ground and wanted somewhere new to go, the problem was I had no idea of where I could legally ride off road. I initially looked at guided rides, but these all seemed to be quite far away and also costing £80 or more for the one day. Then luckily somebody mentioned the TRF to me and the fact that they run monthly guided rides for free to its members. At first I was not sure I wanted to be a member of a group, but at £45 to join for a year I figured that even if I only go on one ride per year it would be cheaper than other places, plus you have the added bonus of knowing your money is going towards helping keep these green lanes open for the future. Getting ready for my first ride out I was quite nervous, I was worried that I would turn up on my pristine trail bike and fall off at the first sight of mud while everyone else blasted off into the distance on mega fast enduro bikes. But I had no need to worry, as I arrived at the meeting point the first thing I notice is that there is a right mix of bikes and everyone seemed friendly and welcoming. The first few trails were slightly uneven gravel tracks, so nothing too daunting as a start. 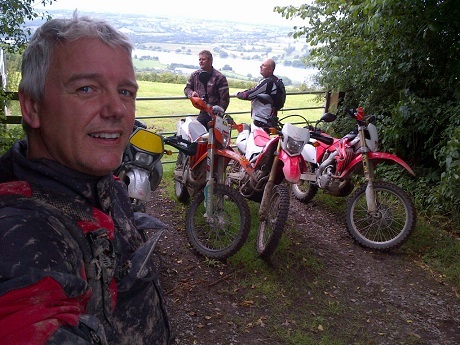 We then came to a couple of slightly more tricky trails, but again, even as a relative novice, I was able to cope OK. We stop to top up with fuel and have some lunch halfway through the day, and a chat generally about bikes, the ride so far, life etc. After the break we came to a field that has a long run of ruts you have to ride down, I hate ruts! 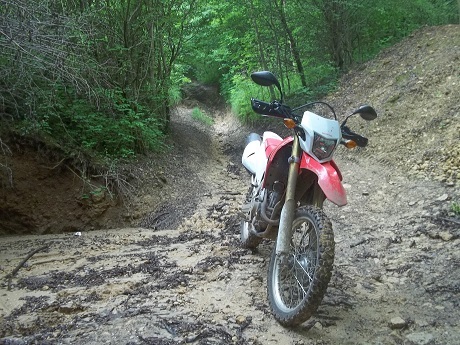 Your wheels go where the ruts go and not where you want (well, that’s how it is for me anyway), so it was first gear with my feet down, but to my surprise I was not the only one using this method to deal with them. Sure, a few of the experienced guys on enduro bike just whizzed along as if they were on flat ground, but people wait at the end of each lane so you never get left behind no matter how slow you are. 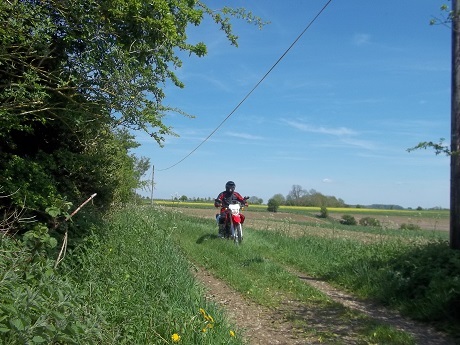 After my first ride out I thought I fancied trying some of the harder lanes, so for my second ride out I went on one of the more difficult routes that Gloucestershire TRF use. It certainly was harder, with the first lane requiring people to get off their bikes and help push others up the hill. 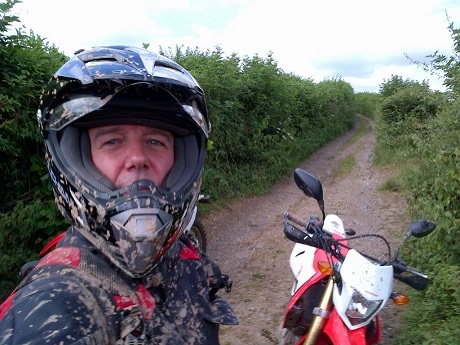 I was knackered and only half hour into the days ride! Fortunately the others could see the state I was in and so took a 10 min break so I could recover. Luckily the rest of the day was not quite as extreme, but was still very exciting and a bit more tricky than my first ride out, resulting in me dropping the bike a few times, but as it was all very low speed no harm was done and was just all part of the fun. 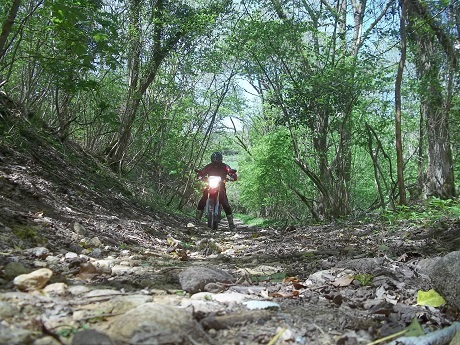 I am now eagerly looking forward to next months guided ride out!